Bivalvia Synthesis is a tiny box packed with plenty of synth power. Even in a time when people are able to put vintage synths in their pockets or use them to decorate their homes, did you ever think one could double as an art piece? Love Hultén, the craftsman fusing modern technology with hand-made, vintage aesthetics, may change your mind. 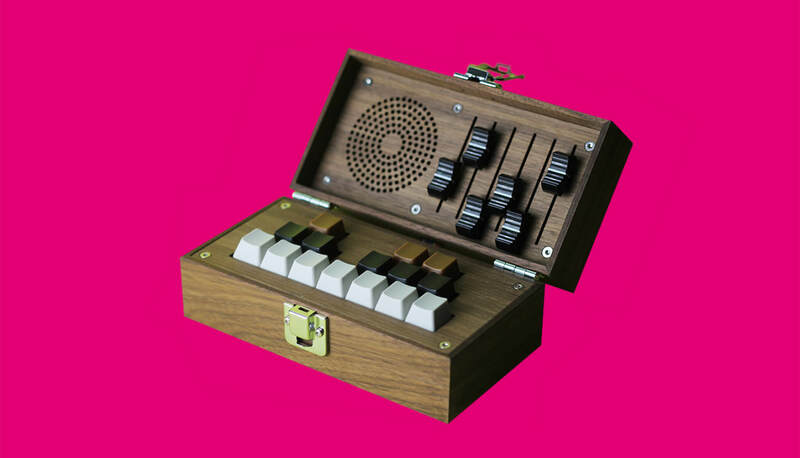 From his personal studio in Gothenburg, Sweden, Hultén creates “attractive alternatives to contemporary appliances” that make what ever you’re doing way more pleasant to look at, and his newest creation is a tiny wooden box that contains a surprisingly powerful synthesizer. “Bivalvia Synthesis,” named for its clamshell casing, includes a built-in speaker unit, a typewriter-esque single-octave keyboard—plus octave and patch-shifting buttons—and six knobs or faders. The entire device is powered by Axoloti, an open-source synth engine with compatible software you can use to customize your own patches. Check out the little box in action above, and for more information on the synth, head over to Gearnews here.